If your budget-strapped K-12 clients are like most, they could really use an extra $10,000 to improve or update their IT environments. So why not give them that opportunity? Make a list of the K-12 customers that can most benefit from a technology makeover. Document each school’s needs with photos or videos. Visit k12makeover.apc.com, click Upload an image or Upload a video and complete and submit the application for each school or district on your list. Share the picture or video using the hashtag #APCK12Makeover19 via Instagram, Facebook or Twitter (reference @APC_Channels). The contest ends on June 30, 2019 so submit your entries today! APC partners will receive a $25 Visa gift card for each entry submitted (up to 10). If your client is selected for the $10,000 makeover, you’ll also receive $1,000. The winning school/district can choose most any IT equipment—power protection, routers, servers, Chromebooks, tablets, touch-screen monitors or whatever IT gear students need to succeed. Not only will the winning school appreciate new IT equipment, it will cement their trust in you as their IT advisor. The contest is open to any K-12 public or private school or district in the U.S. and anywhere they store IT equipment: a data center, wiring closet, server room, a janitor’s closet or anywhere else. Again, the deadline is June 30, 2019, so find the IT areas that need the most improvement, take pictures or video, enter your school or district, and share it on social media. We look forward to seeing your “winning” candidates. 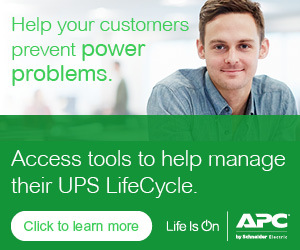 To learn more about APC’s IT solutions for education, visit apc.com/education.